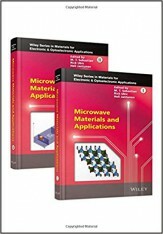 abstract	 This chapter discusses the important microwave dielectric materials, such as spinel, Li2ATi3O8 ceramics, and Li2Zn3Ti4O12. The zinc aluminate spinels are finding versatile applications in industrial ceramics, radiation resistant matrices in nuclear bombardments, and supports for Pt catalysts. Zinc aluminate has very low electrical conductance, which is a unique characteristic of low‐loss dielectrics. BaTi4O9, BaTi5O11, and Ba2Ti9O20 have low dielectric loss and high relative permittivity, useful for dielectric resonator and capacitor applications. Alumina ceramic has excellent properties such as low dielectric loss, εr of about 10, high thermal conductivity, a high melting point of about 2050 ºC, and good chemical stability, and is extensively used as microwave substrates in different applications. Alford and Penn showed that the dielectric loss of sintered materials can approach that measured in single crystals. The Ti‐rich compounds in the BaO‐TiO2 system exhibit good temperature compensation with very good relative permittivity and low dielectric loss.